When Stadium Vendors enters the battlefield, choose a player. 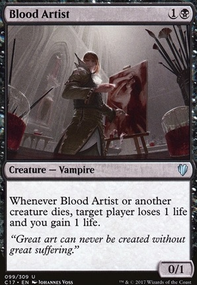 That player adds two mana of any one colour they choose. 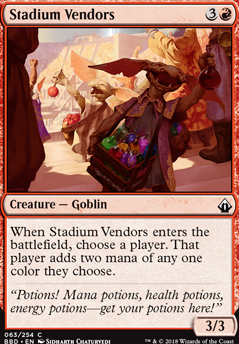 Out: Stadium Vendors - Not a bad budget option for Infinite mana with Cloudstone type bounce but not needed when you have all the other options. In: Simic Ascendency - Alt win-con. Puts me up to a nice unlucky 13 non-creature spells in the deck. 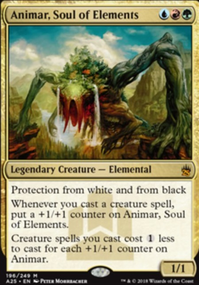 Also upgraded to foil Animar. Pretty good deck. I do have a few suggestions though. I'll try to break it down by category. 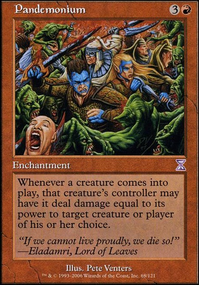 Ramp - Wood Elves , Sakura-Tribe Elder , and Rishkar, Peema Renegade . 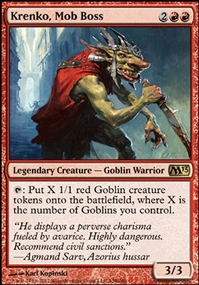 I also count Hardened Scales / Pir, Imaginative Rascal as ramp here. Draw - Primordial Sage and Tishana, Voice of Thunder . You want as much draw as you can get that's caused by your actions and less that's reliant on your opponents like Nezahal. Bounce Enablers/ Targets - Equilibrium and Tidespout Tyrant for enablers. Cloud of Faeries , Great Whale , Palinchron , and Stadium Vendors for bounce targets. Board Protection- Draining Whelk is all that comes to mind that's a permanent.